Comet 300632 (A-DF) Go Kart belt - Comet 300632 Go Kart Belt, Comet 300632. Used in UTV’s, Go Kart Belt Drives, People Movers, Golf Cart CVT, Mini-Bikes CVT, and ATV's. Home > Variable and Multi-Speed Belts > MULTI-SPEED BELTS > 1430V500 Multi-Speed Belt, Industrial Grade. > 1430V315 Multi-Speed Belt > COMET 300668 (A-DF) Comet Industries belt > COMET 300632 (A-DF), Comet Industries belt replacement Go Kart belt. COMET 300632 - Replaces original Comet Go Cart Belt #300632A/DF-DP. COMET 300632 (A-DF), Comet Industries belt replacement Go Kart belt. Comet 300632 Go Kart Belt. 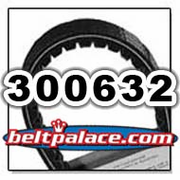 Replacement belt for Comet Industries 300632 and 300632A. This kevlar reinforced Go Kart torque converter belt measures 31/32” (0.96") Inch Wide, 45.2 Inch Length OC. Symmetric Cogged belt. This belt for use as Go Cart belt, Golf Cart clutch belt, UTV-People Mover clutch belt, and Mini-Bike drive belt.